Last week, I headed back to Surrey Quays, which is the neighbourhood we lived in when we first moved to London. It is always nice to go back and see how the area has changed. I am so happy when I go back to the area, probably because of the fond memories of our gorgeous flat and exploring London with fresh enthusiam. 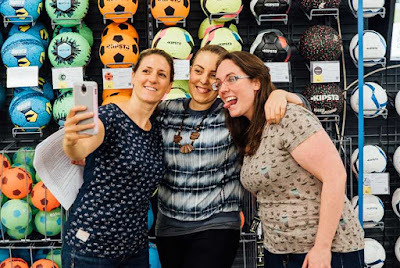 When we lived there, the Decathlon in Surrey Quays was the only one store in the UK. Most of my personal training/fitness kit and cycling accessories came from there, as it was easy to access and really affordable (it took me 2 years to stop converting pounds to dollars). In the USA, most stores carry a variety of items while I find in the UK you have to go to a specialist store to find each thing you need. 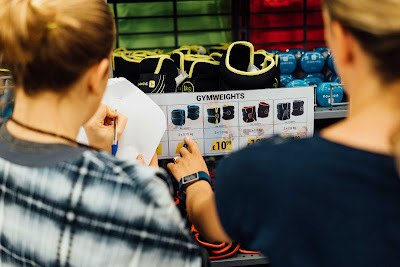 Decathlon has everything from running kit to ski gear to protein powder to free weights to warm fleece for the winter and wellies for dog walks in the spring to good old bike inner tubes. But it wasn’t until the scavenger hunt that I learned just how much variety they offer. 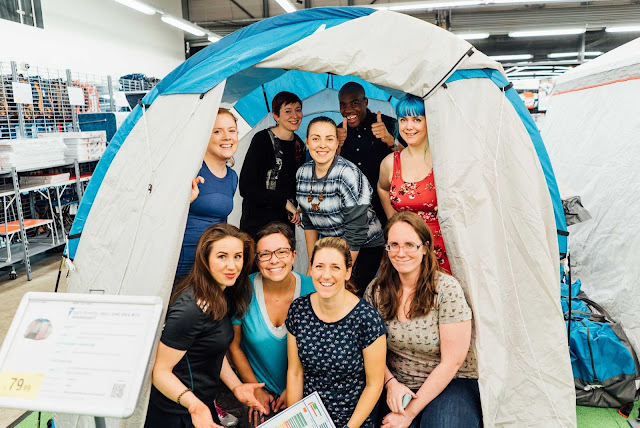 Decathlon kindly invited nine bloggers down for a fun scavenger hunt through the store. There were three teams of three and I was on the Pink Ladies with Beki and Eileen. 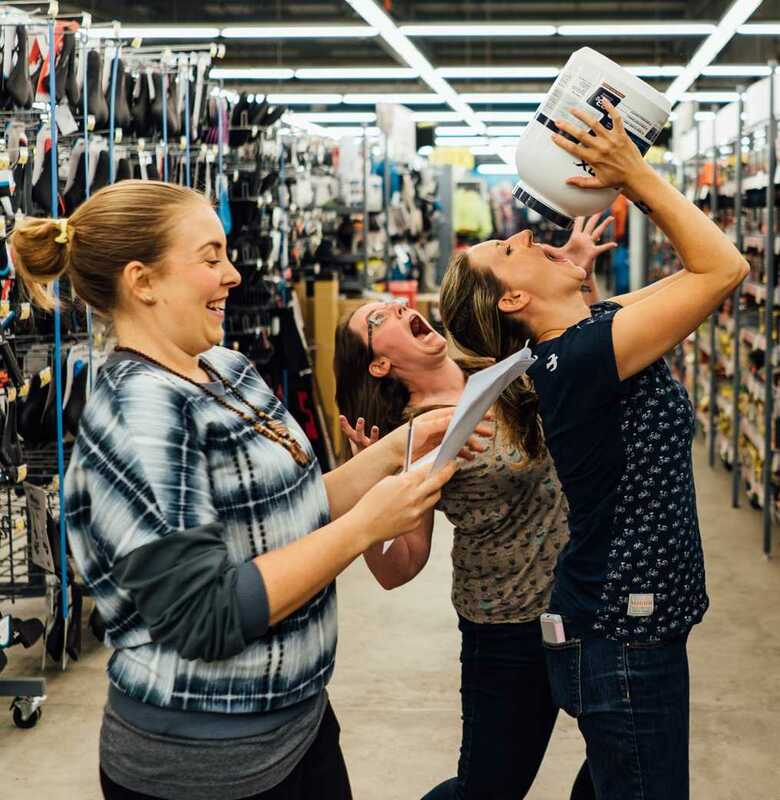 Each team started in different parts of the store and had a dozen or so questions to answer about the products on the shelves. We also had a bonus question about the Decathlon brands and what sporting discipline they represented. 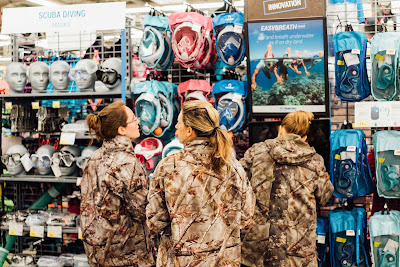 I had no idea that Decathlon had over 20 of their own brands for everything from camping to swimming to rock climbing to equestrian to court sports. They also carry big brands, such as Nike, Adidas, Salomon, Karrimor, etc. but in my experience, I have found that the Decathlon quality is just as good depending on what I need and how much I am willing to spend on it. No one told us we were going to have to do math as part of one of the tasks. Decathlon even has their own brand of fitness technology products, Geonaute. If you are looking to invest in a heart rate monitor, GPS watch, action camera accessories, or ear buds, have a look at their selection. 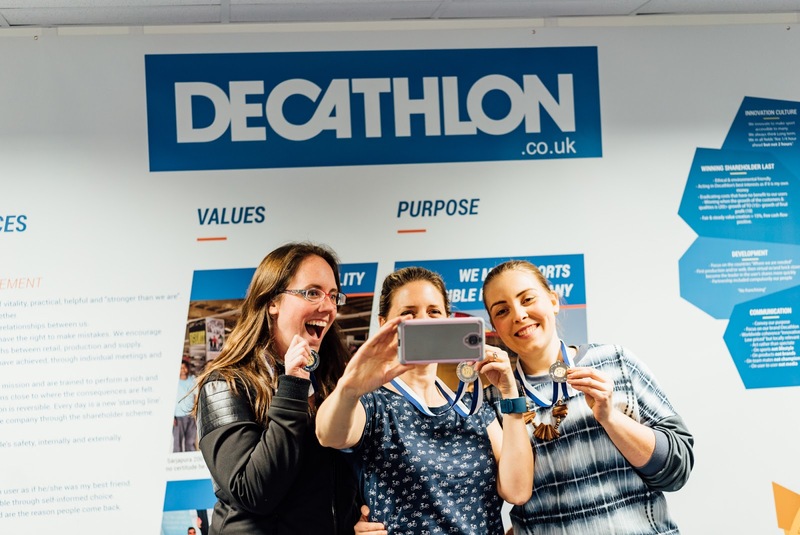 With Decathlon, they really aim to remove the finacial barrier of getting stuck in to a new sport or physical activity. Often times, I see people discouraged from trying something new because they don't have the proper equipment or don't want to invest too much in case they don't like it. After walking around the store, I can tell you there are many products that can help increase your heart rate without decreasing your bank account by too much. 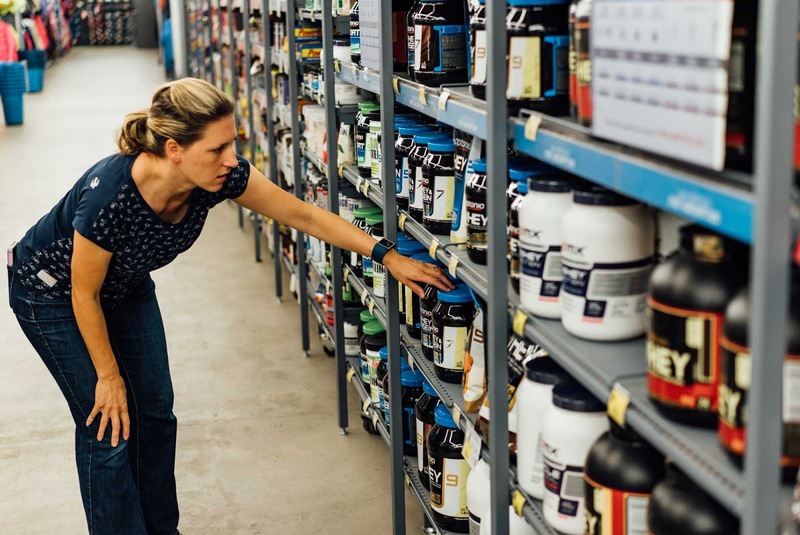 Trying to find the right strawberry-flavored protein and one of the answers to our questions. I just wanted to eat all the protein. Apparently, Eileen did too. 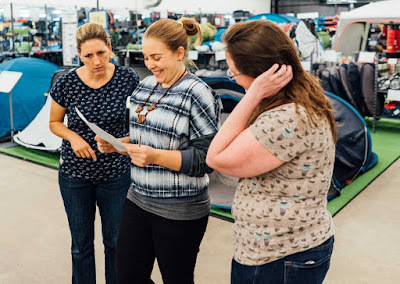 After exploring nearly every bit of the store looking for clues, I am thrilled to say that our team won and were given awesome medals for our efforts while we enjoyed some great canapes and wine with the other bloggers. Each attendee was also given a brightly colored 20L rucksack, a fitness ball, a running bumbag, and soft microfiber towel. I was actually eyeing the 1 bottle carrier belt bumbag for the London Marathon and have pleased with it so far. First place team celebrating our win over social media. 'In-tents' bloggers after the challenge was over. The scavenger hunt would be a lot of fun for families or schools to learn more about different types of ways to be active and there is a great potential for it to be even more interactive with the products available. I found a few new pieces of kit I would like to try (stand up paddleboard, horseback riding boots, and a Subea face mask with a snorket built in). As this was the first time the scavenger hunt was put on, Decathlon is taking our feedback and will tweak the experience a bit more (I suggested adding a time limit). 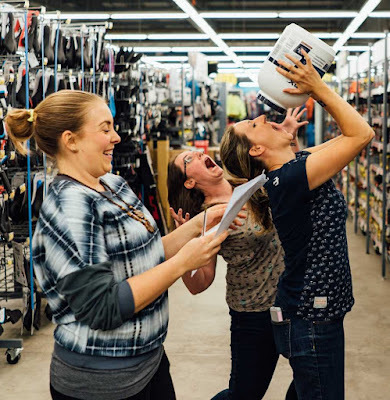 I would highly recommend keeping your eyes out for similar interactive events at your local Decathlon store. You can always stop by and have a wander around though to see what inspires you to get more active and/or explore the outdoors. 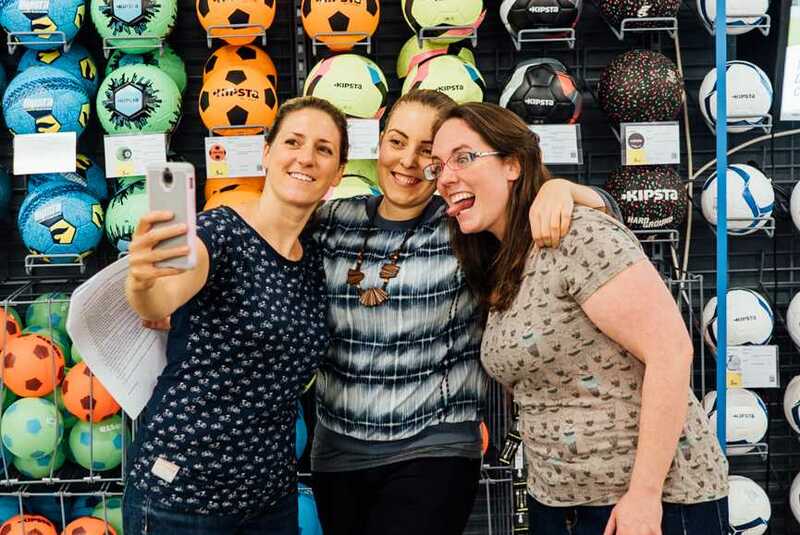 Thanks to Decathlon for providing us with a fun evening and great sporty items. All opinions are honest and my own.